FROSTBURG – An apparent accidental fire destroyed the 192-year-old Clarysville Inn early Wednesday and left a family of five who operated businesses there for the past four years homeless along with two other tenants. “I’ve never been in this position before,” said Tom Pecora, who operated the businesses at the Clarysville Inn since March 1995, when he and his family left behind a successful catering business in Baltimore for a new life in Allegany County. Pecora sipped hot coffee and soup as he collected his thoughts, dressed in clothes given to him after he and his family escaped with only the clothes on their backs. They lost all of their belongings, including wallets, eyeglasses, prescription medicine, and countless irreplaceable items such as wedding photographs. The cause of the 2:30 a.m. fire, which resulted in a property loss estimated initially at $500,000, appeared to be accidental, fire investigators said. “The origin of the fire has been located in the Memories nightclub. We are still working on the exact cause of the fire but it does not appear to be suspicious at this time,” said lead investigator Deputy Fire Marshal Bruce Shafer. 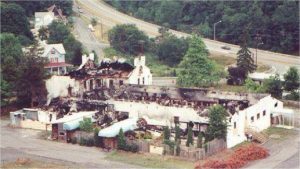 The night spot adjoined the three-story inn that housed three apartments, the Clarysville Inn Restaurant and Tom’s Beef & Brew, which featured barbecue pit beef sandwiches. Minor injuries occurred to two volunteer firefighters who were treated at the scene by Frostburg Area Ambulance, according to the Allegany County Office of Emergency Management. Their names were not available. “The fire never went out. It’s still burning back there. It’s unbelievable,” said Pecora at about 9:30 a.m. He and his wife Melissa, daughters Amanda, 23, and Alissa, 15, escaped the fire without injury. Son Aaron, 18, was at a friend’s house, and sons Adam and Andrew were at Adam’s residence in Frostburg when the fire broke out. Second-floor apartment tenant Brad Stubbs also escaped the fire. Russell Horning and Mary Clausen were asleep in the third-floor apartment along with Horning’s German shepherd Rox, unaware of the emergency until a shoeless Tom Pecora showed up. Tom Pecora brushed off the hero talk and pointed to a practical lifesaving device.”We had a smoke detector that worked. We did and it saved our lives. It also saved Russell and his girlfriend by alerting us in time to get them out,” he said. Shafer said the Clarysville Inn property was insured. The property is owned by Paul Green of Cumberland. Green said he purchased the property in 1980 but he declined further comment. The State Fire Marshal’s Office is continuing its investigation with the assistance of the Allegany County Combined Criminal Investigations Unit, according to Shaefer, who was assisted at the scene by Deputy Fire Marshals Steve Wendling of Garrett County and Jim Woods and Bob Maddox, both of Washington County and John Brazil. 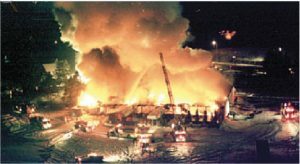 About 75 volunteer firefighters from 18 companies responded to the three-alarm blaze and were hampered in the firefighting operation by insufficient water supply, freezing cold and steady snowfall.